Your third printable here! This is a great one creative soul, how do you nurture YOUR soul? How do you take care of you, so that you can tap into that amazing creative part of you? Sometimes we lead such busy busy lives, nurturing our little ones, our homes and our jobs or businesses, that we forget or don’t make the time to look after our inner selves. It’s so important to do so though, especially if you are running a soulful or creative business around family life or another full-time day job, or you can end up grumpy, burnt out or getting creative block! Why don’t you write down 5-10 things you can do that helps you nurture your soul, that way when you can make time for them a little each day so you don’t end up heading for burn out! Make sure some are only 10 minutes, as sometimes it is hard to squeeze some nurturing in isn’t it? Hopefully this artwork will remind you, maybe on your vision board, to make some time for you. Stick both the printable and the list up somewhere as a reminder. 1. I like to take some flower essences. 2. Grab a hot cacao drink with cinnamon and put my feet up for 10 minutes. 3. A walk – preferably by water. Taking nature in, breathing in fresh air. 4. A guided meditation or yoga nidra. 5. A good old chat to my partner, friend or mum. 6. Baking a cake or cookies for me and my loved ones. 7. Taking time to do a spot of doodling, hand-lettering or some other creative craft. 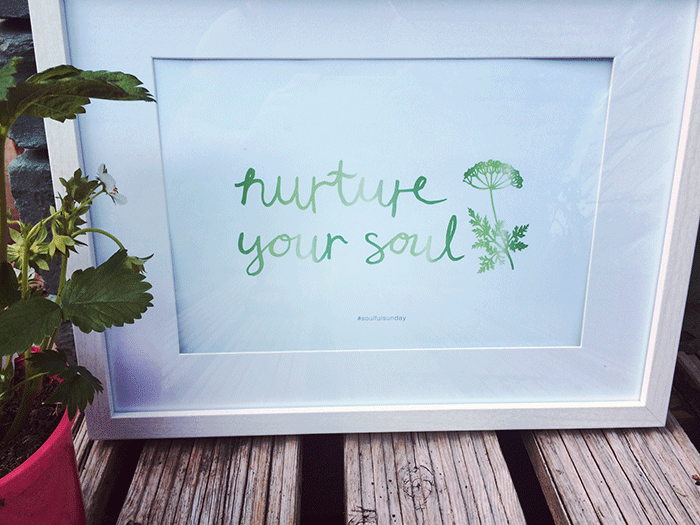 If you would like this free printable to inspire you to nurture your soul then pop your email in the box below. You will then be part of my soulful sunday club and receive an inspirational printable every fortnight. Enjoy! ** This printable has now expired but if you want to join the #soulfulsunday club to get a free printable every fortnight then pop your email in the box below and you will receive the latest illustration plus every other going forward! Pop your email in here to join the soulful sunday club and you will receive a free inspirational hand lettered printable every fortnight. Copyright Creative Soul Marketing © 2016 | Based in Central Portugal & The Lake District, UK.